2 Why force reboot an iPhone XS, iPhone XS Max? 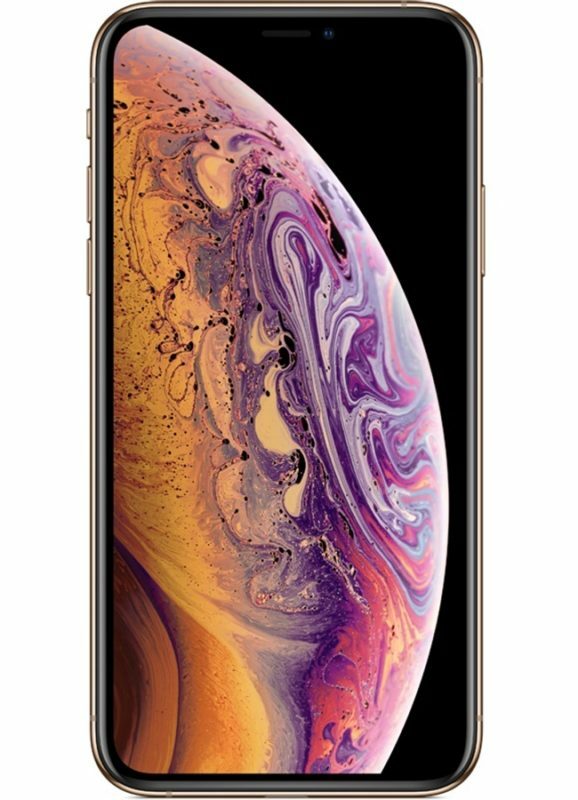 The iPhone XS Max, iPhone XS, and iPhone XR have new and different methods for force restarting these model iPhones, due to the fact that none of these models have a Home button. Initiating a forced restart on these new iPhone models may be different and slightly more complicated than before, but it’s still easy enough that even a novice user can master the method. This article will show you how to force reboot an iPhone XS and iPhone XS Max. If you’re already accustomed to the procedure for force restarting iPhone X or force restarting iPhone 8 then you’ll be in familiar territory because forcibly restarting all of those devices is the same as force restarting the iPhone XS, iPhone XS Max, and iPhone XR. If you do not see the Apple  logo, then you did not successfully force restart the iPhone XS, iPhone XS Max, or iPhone XR, and you’ll want to repeat the process again. You may need to keep holding the Power button for what feels like a while before the Apple logo appears on the screen, it’s a much longer hold on that button than any of the others which just need a quick press and release. 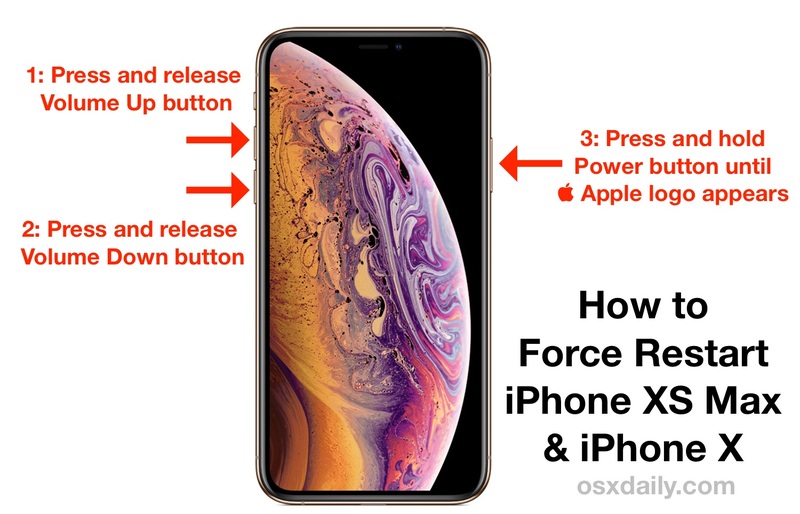 If you failed to forcibly restart the iPhone XS Max, iPhone XS, or iPhone XR, simply repeat the steps above until you succeed. Press and release Up volume, press and release Down volume, then press and hold Power button until you see the Apple logo. Pretty easy, though yes it is different from many earlier model iPhone devices. While this is how you force restart an iPhone XS and iPhone XR, you can also apply other methods to simply shutting down the devices, like using the Settings approach to shut down an iOS device, without even touching any buttons, which you can then turn back on. A standard shut down and startup is NOT the same as force restarting an iOS device however. An improper attempt at forced restarting an iPhone XS or iPhone XS Max will likely result in something like a screenshot being taken, so if that happens then you did something wrong as obviously a screen capture is not in the process of force rebooting. While this approach is the same as force restarting an iPhone X and iPhone 8 and 8 Plus, it is different from force restarting iPhone 7 Plus and iPhone 7, which is also different from force restarting any iPhone or iPad with a Home button. While there is some fragmentation in the approaches to force restarting for now, presumably all future iPhone and iPad models will have no Home button or alternate methods of force restarting and will then therefore all fall into line with how the process works on iPhone XS Max and other new iPhone XS and iPhone XR models. Why force reboot an iPhone XS, iPhone XS Max? 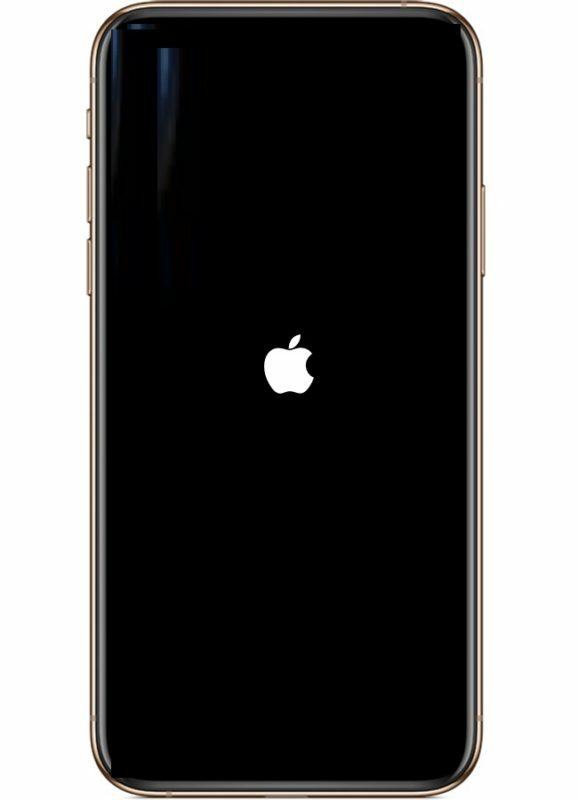 The primary reason most users will ever need to force restart an iPhone XS Max or iPhone XS or iPhone XR is if the device is frozen, unresponsive, or crashing. It’s a very common troubleshooting trick that often remedies many iPhone (and iOS) issues. The force restart procedure interrupts whatever is going on with the device to forcibly reboot it. This can lead to data loss from current apps and onscreen activity however, so you should not forcibly reboot if you’re currently engaged in something on the screen that is important or unsaved.